A festive red Father Christmas badge on a beige and red background made to look like a Christmas bauble, and with a picture of a festive fat father Christmas in the middle holding another Xmas bauble. 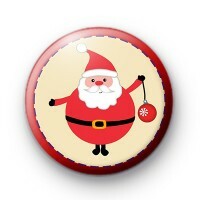 This Father Christmas (Santa Claus) badge is one of our cutest & most popular Christmas badge designs. These are great to hand out to your children, or if you are a teacher you can give them out to your students along with a traditional Ho Ho Ho! Also great little stocking fillers and small gifts. Our Christmas Badges are all handmade in our family run badge workshop (pun intended) and we deliver to customers all over the world. What's more, you can qualify for free delivery on larger orders, so add a selection of Christmas badges & receive free delivery. Standard 25mm button badge.